Sadiq Khan, the London Mayor has extended a demand for a 2-year Post-study work visa from the UK government for international students. He also sought the removal of the present thresholds on visas for professionals of non-EU nations. He was suggesting these reforms to promote a better UK economy after the Brexit happens. He cautioned that the present approach adopted by the government was based on immediate political concerns and neglected the overall economic stability of the nation. He advocated the cause of freedom of movement as it brought several advantages to the economy. Not denying the need for secure borders and a proper immigration system Mr. Khan said that there is the great benefit of having a simple and easy immigration system instead of a tough one. This will make certain that global talents reach the shores of the UK and contribute towards a thriving economy. They will lead to increased opportunities, better jobs, and more wealth. 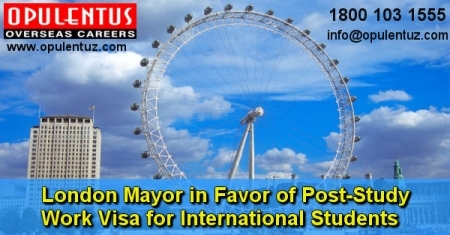 These proposals, made on October 11th were a part of the immigration package for overseas students being strongly advocated by the London Mayor. There is a long-standing demand to eliminate overseas students from the net UK immigration statistics. Moreover, he also spoke about adopting a dynamic approach for overseas talents. Adding to the demand for the 2-year Post-study work visa for overseas students, Sadiq Khan said that the present visa system meant for non-EU students was not planned considering the implications of the Brexit scenario. He spoke in favor of enhancing the opportunities for skilled and talented professionals from areas which are outside the EU. There must be no restrictions on skilled migrants he concluded. We offer all the services in this domain and will be happy to answer any queries regarding the opportunities available in Britain. If you are interested in Immigrating to UK get in touch with Opulentus, a top company for services in the field of immigration. Please contact us at [email protected] or call us 1800 103 1555. Our experts will meet your expectations and provide answers to queries.